When Berry Driscoll arrives in Heaven, he – like all residents in the afterlife – receives a copy of a travel guide/advice book that he wants to share…with the living. With help from a love-struck World War II veteran, the book’s editor, a wondrous teleporting cat, and the Devil himself, Berry’s return to Earth sets off a firestorm of reactions with a unique cast of characters. 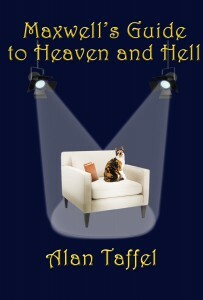 This sequel to “Heaven, Inc. – A Helluva Novel” combines mystery, adventure, romance, and fantasy while taking on pop culture, religion, politics, cats, and even golf with uncommon style and humor. All of my characters are based on real people I know. High noon. The two men stood facing each other, twenty feet between them. There were only small pools of shadow beneath each one, the sun being almost directly above them. One wore a pair of once-black pants, now faded to a non-descript gray, a dark blood-colored shirt, and a scuffed leather vest that had lost its sheen long ago. His Stetson was pulled far down on his forehead. An 1865 Army Colt hung low at his side in a well-worn holster, a rawhide tie knotted around his lower thigh holding the rig in place, his hand menacingly close to the pistol’s polished wooden handles. A half smoked cigarette he had rolled himself between his lips. The other man was clad in black from head to feet: knee boots, black trousers, a long duster coat, colonel’s tie, a black wide-brimmed hat with silver conchos adorning the leather band. He opened the front of his duster and made sure the coat was clear of the two holsters that carried a pair of matching Colt Peacemakers, engraved nickel with pearl handles, crisscrossed and worn high on his waist. Each handle bearing the abstract image of a steer head and horns. His left hand close to the gun on the right, his right an inch from the other. A pair of leather bandaleros filled with bullets crisscrossed his chest, their brass cartridges glinting in the sunlight. A couple of shoppers emerged from a storefront midway between the two men laughing. They immediately took notice of the two men and fell silent. Neither of the two adversaries appeared to take notice, concentrating on each other only. There were people on both sides of the street, all quiet, intent on the drama unfolding before them. A crow cawed in the distance. Neither one said a word to each other. They each had their own strategy. The man in black watched the hands of the man before him. The other stared only at his opponent’s eyes. They drew their weapons almost simultaneously. Two shots were fired, one a fraction late, going high and wide to the right. The man with the cigarette’s aim was true, hitting the man in black in the chest. Blood spread quickly as he fell backwards onto the dusty street. Cigarette man walked the twenty feet and looked down at the body. The man’s blood was slowly receding, the wound closing. He opened his eyes and smiled. “Damn fine shot, Pard,” he said. The small crowd disbursed, going about their business. Another perfect day in Heaven.